FIFA 15 is the next release of the legendary franchise from EA, FIFA. Many technological developments have been added in this title whose launch is planned for September 2014. This is the XBOX version of FIFA 15 Ultimate Team Edition. The Ultimate Team Edition includes: 40 Envelopes Gold a week since its release 40 weeks for use in FIFA Ultimate Team. Each packet includes 12 items like gamers, contracts, stadiums, coaches, staff, complimentary fitness and recovery from injury, balls, jerseys, coats and styles of chemistry. Players from the Gold Envelopes have a score of 75 or more, and these envelopes also include a single item. Unique items are for example improved attributes or players with longer contracts. 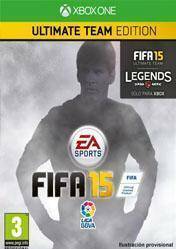 Also includes some items in the catalog of EA, including Messi. Ultimate Team is a massive online community of players, where each functions as a coach of a football team: Creates, manages and races his own team. A community of 11 million fans and where we can start creating our own superstars team, and where we will be gaining currency, and buying and selling players worldwide users of FIFA Ultimate Team. We can face our dream team against our friends and players from around the world. Create and manage multiple teams and play in the Online Tournament or Single Player that appear every week. There are no comments yet about FIFA 15 Ulimate Team Edition. You can be the first one! FIFA 19 ROAD TO GLORY #170 - I HAD TO REPLACE HIM!